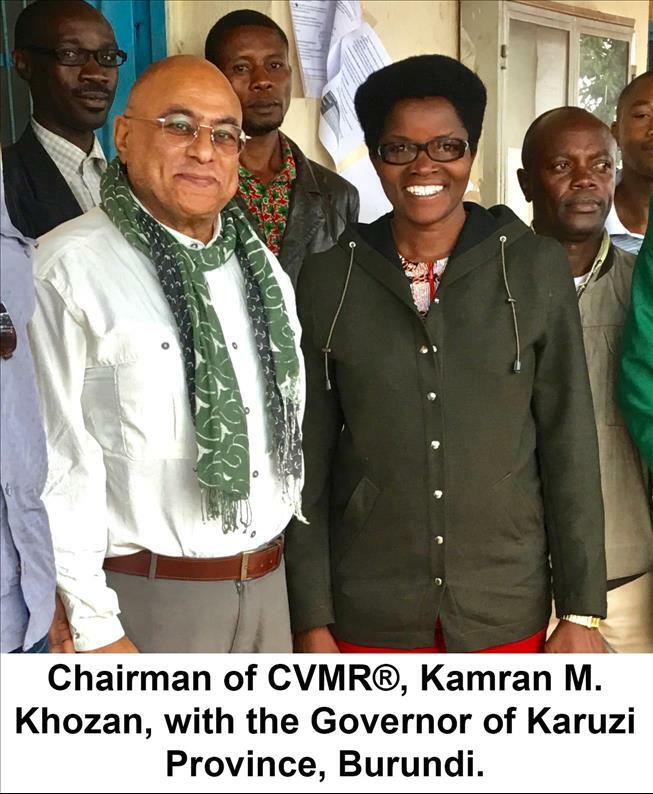 (MENAFN Editorial) TORONTO, September 20, 2018 (Newswire.com) – Honourable Côme Manirakiza, Minister of Hydraulics, Energy and Mines of the Republic of Burundi, informed La Société CVMR Energy Metals Burundi SURL (CVMR®), a subsidiary of CVMR Energy Metals Inc. of Canada, that the Cabinet of the government of Burundi has approved the awarding of mineral concessions Waga and Nayabikere to CVMR®. The Right Honourable Pierre Nkurunziza, President of Burundi, ratified the decree on Sept. 14, 2018. This will now allow CVMR® Energy Metals to initiate a public offering of its shares in the Toronto and London Stock Exchanges. CVMR® now owns the mineral concessions of Mukanda, Waga and Nayabikere in Burundi. CVMR® Energy Metals has already spent about $12 million US dollars on the Pre-Feasibility Study of the Mukanda mine. Mukanda has an estimated market value of $2 billion US dollars in proven reserves of vanadium and titanium. CVMR® Energy Metals will be spending an additional $20 million US dollars to complete the Feasibility Study of Mukanda. Mukanda minerals of vanadium and titanium cover an area of 144 square Kilometers. Two previous surveys conducted by the United Nations and later a Swedish mining company have confirmed a total of 6,500,000 metric tons of vanadium ‘Proven Reserves,’ 7,300,000 metric tons of Probable and 5,000,000 metric tons of Possible, vanadium reserves. The Pre-Feasibility of Mukanda was completed with the participation of Jacob Mining Engineering in April 2018. It forecasts a net cash flow of over $1.6 billion US dollars over 10 years at a capital cost of approximately $250 to $300 million US dollars. The result of the Pre-Feasibility Study for Mukanda was sent to the Ministry of Hydraulics, Energy and Mines of Burundi for their review and evaluation. The Pre-Feasibility Study was approved by the government and CVMR® was given the green light to proceed with a full Feasibility Study in accordance with ‘NI 43-101′ standards of Canada. Although CVMR®’s Pre-Feasibility Study on Mukanda confirmed the accuracy of previous findings of its mineralization, the surveys will have to be repeated once more in accordance with NI 43-101 regulations. CVMR® will be using the expertise of DRA Global engineering firm and Jacob Mining Engineering to complete the process. The Canadian National Instrument 43-101 (NI 43-101) requirements entail an aerial geological and ground survey and mapping of the property, drilling and mineral core sampling and testing. NI 43-101 is a mechanism for the standards of disclosure for mineral projects within Canada. It is a codified set of rules and guidelines for reporting and displaying information related to mineral properties owned and explored by companies, which report these results on the stock exchanges within Canada. All Feasibility Studies conducted by a Canadian mining company that plans for an IPO in Canada have to adhere to the strict guidelines of NI 43-101. The full Feasibility Study for Mukanda is expected to cost a further $30 million US dollars. Jacob Mining Engineering has confirmed the receipt of funds from CVMR® to complete the Feasibility Study in coordination and assistance of DRA Global engineering company. So far CVMR® Energy Metals has spent in total $42 million US dollars on Mukanda. A team of geologists, mining and refining engineers from CVMR® are expected to arrive in Bujumbura in November of this year to meet with the officials of the Ministry of Hydraulics, Energy and Mines in order to complete the preliminaries of the Feasibility Study on the Mukanda project and to initiate the Pre-Feasibility Studies on Waga and Nayabikere. Waga and Nayabikere jointly cover some 218 square kilometers of land and have a total estimated reserve of 1,088,000 metric tons of nickel, 25,200,000 metric tons of iron, 30,000 metric tons of cobalt and 17,800 metric tons of copper at a total estimated current value of $30 billion US dollars. CVMR® Energy Metals will be spending some $60 million US dollars on the Feasibility and mining plans of Waga and Nayabikere. CVMR®’s representative in Burundi, Maître Onesphore Baroreraho, emphasized the importance of these projects and their impact on Burundi’s economic development and thanked the Ministry of hydraulics, Energy and Mines and the Burundi government officials for their cooperation and assistance in these important projects.